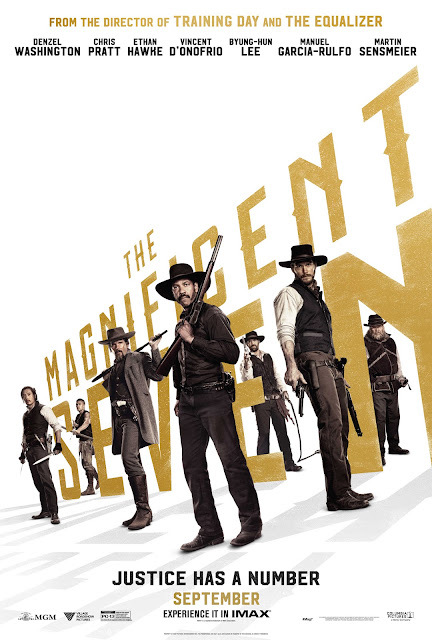 Dearest Blog: Yesterday it was off to Marquee Cinemas for one of my more anticipated offerings of 2016, Antoine Fuqua's remake of The Magnificent Seven. Spoiler level here will be mild, nothing you wouldn't know from the trailers. When a brutal robber baron tries to steal a town right out from under its inhabitants, the townsfolk turn to an eclectic band of gunslingers to defeat him. So, dear reader(s), you're tired of remakes and reboots and rehashes, right? I hear ya. Hollywood apparently doesn't, but I do. Scarred though you may be by lady Ghostbusters and a decidedly Michael Bay-ish Ben-Hur, I'm asking you to give this one a chance. Please. Throwing the universe's most watchable actor, Denzel Washington, into an ensemble picture is a bit like putting a perfect diamond on a CZ-tennis bracelet--no matter how good the rest is, it won't compare--but he does a masterful job of leading this pack without actively scene-stealing. His diverse group of not-so-merry men is uniformly fantastic, with Byung-hun Lee and the brilliant Vincent D'Onofrio nearly walking off with the movie. Gunfights are tightly-choreographed chaos, a delight to watch. The picture also boasts some majestic scenery and a lovely score by Simon Franglen and the late James Horner. Throughout, it feels like a throwback to the glory days of Hollywood westerns. Among The Magnificent Seven's relatively few weaknesses: It relies just a little to heavily on Chris Pratt's appeal, while criminally wasting the lovely Matt Bomer. Haley Bennett overacts like a madwoman at times. There are some weirdly obvious inaccuracies, like blindingly-white teeth all 'round, and a few prominently-placed prostitutes who more closely resemble 1980s video extras than anything from the wild west. The entire cast is sweat-shiny for the duration...except Denzel, who is cool as a cucumber until the very end. Also, the movie is occasionally so very traditional as to appear almost comical on today's cinema landscape. This remake defies many current cinema norms. Though a battle is the picture's primary focus, there are no bloated, never-ending fight scenes. The pace is deliberate, but the movie is never dull. There's surprisingly little graphic gore, despite a Game of Thrones-esque body count. The single female lead provides opportunities aplenty, yet she's never shoehorned into a romance with any of our heroes. Finally, this film is utterly disinterested in kicking off a franchise. Come on, reader(s), when was the last time you walked out of the theatre without feeling like you'd just been set up for the next sequel? The Magnificent Seven is a beautifully-filmed, epic western that features top-notch performances from some of today's best and most-loved actors. Simply put, movies like this are why I go to the movies. Of a possible nine Weasleys, The Magnificent Seven gets eight.